The part-time Morning MBA holds classes from 7 to 8:59 a.m. on Tuesday and Thursday mornings. This MBA is ideal for working professionals who want to advance their career while still working full-time. The program starts in August and can be completed in 32 months. With a curriculum much like the full-time and Morning MBA programs, the Evening MBA program is also a part-time program that holds classes held from 6:30 to 8:30 p.m., twice per week. It also starts in August and can be completed in 32 months. Students enrolled in either of the part-time programs will experience the same learning style that is offered to full-time MBA students. They will take classes twice a week, allowing them to keep up with their work schedules. The program begins in August, and students will take part in an orientation week before starting the main program. The program begins in the first year with core courses such as Managerial Negotiations, Statistics for Management and Managing Customer Value, which help build a solid foundation of business knowledge. In the second year, students may choose to specialize in a particular area of interest or develop a broader skill set through elective courses. There are more than 90 elective courses and over 15 major areas that students can partake in in order to customize their MBA experience. Rotman offers no exemptions for courses completed toward another undergraduate or graduate degree. 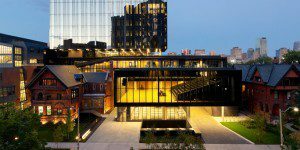 Forty-seven percent of students in the part-time program at Rotman are enrolled in the Morning MBA, while 53 percent are in the Evening MBA. The average student age is 30 and the average amount of work experience is six years. Students come from a variety of career and educational backgrounds. Thirty-three percent of students have an education in business or commerce, and 32 percent come from a financial services career background, making finance the most popular background among students. Students also come from such industries as healthcare, consulting, professional services, and retail. The Class of 2020 featured 76 percent male students and 24 percent female students. For the University of Toronto part-time MBA Class of 2021, three years of part-time study towards an MBA degree tuition is $104,379 CAD for Canadian citizens and permanent residents, and $116,610 CAD for international students—excluding significant ancillary fees (please note that tuition fees, University incidental fees and the Rotman ancillary fees are set annually and are subject to change). The estimated minimum funds a single student would need for living expenses for the first 12 months in Toronto $20,856 to $28,756. There is more than $4 million of financial aid available through the Rotman School of Management. This aid comes in the form of a multitude of loan programs, government financial assistance and employment opportunities for both domestic and international students. Applicants to the MBA programs must have completed a bachelor’s degree or its equivalent for admission. The application fee is $195, and required are two written essays, two letters of recommendation and a current résumé. Note: On average, applicants have six years of work experience, but only two are required. Applicants should have a minimum 3.0 GPA, as well as a GMAT or GRE score (GMAT requirements waived for applicants who have completed CFA III). An English-proficiency score is required from all applicants who have degrees from institutions in which English is not the language of instruction or examination. After the submission of their application, individuals will be contacted to complete an interview. Due to the competitive nature of admissions to the program, successful candidates tend to exceed the minimum requirements.